At Catty Corporation, you have two options when it comes to laminated foil/paper structures; glue lamination and wax lamination. While the two serve the same purpose, to laminate one substrate (i.e. foil, paper) to another, each carries unique properties that can make or break a great wrap. Before we go into the differences between the two bonds, let’s start with the basics – how are laminations made? At Catty Corp, we laminate using a Rotogravure cylinder, an impression roller and a nip point. 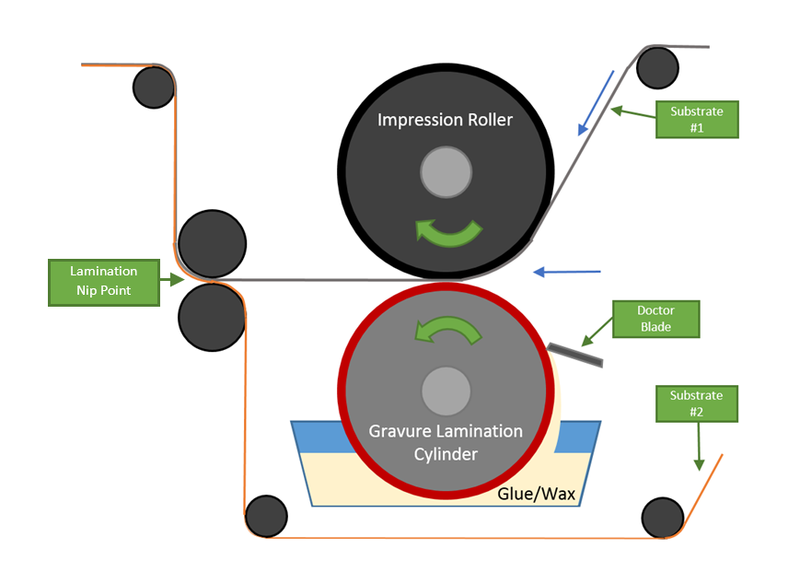 The rotogravure cylinder circulates through a pan of glue or wax to apply it to one side of the primarily substrate. That substrate then travels to a nip point where it is pressed to the secondary substrate and then dried to complete the lamination process. This process produces one bonded structure that can then be printed on in-line. Glue lamination is the most common method used at Catty (as well as industry-wide) to laminate foil to paper. The primary glue we use is a water-based acrylic adhesive that we have customized for added corrosion resistance to better protect the many food products that are wrapped with this structure. The leading explanation for the popularity of glue laminations comes from the economic benefits they provide. On a per pound basis glues are slightly more expensive than waxes, however when laminating it takes close to 50% more wax to achieve the same bond as a glue. At the end of the day we find wax lamination adds a ~3-5% increase in cost to a structure. Beyond the economic benefits glue lamination provides, there are many performances benefits as well. Glue at its core is stronger than wax and can be most easily modified to provide a destructive bond. In addition to easier obtained strength, glue also has post-lamination benefits when it comes to product environment conditions. If stored in extreme heat, the bond from glue will hold longer than an equal-strength wax-based adhesive. The alternative to glue lamination at Catty Corporation is found in wax lamination. Wax was originally used in lamination to provide a structure with better dead fold as once it is dry, it holds no memory and will form to a new shape with least resistance. 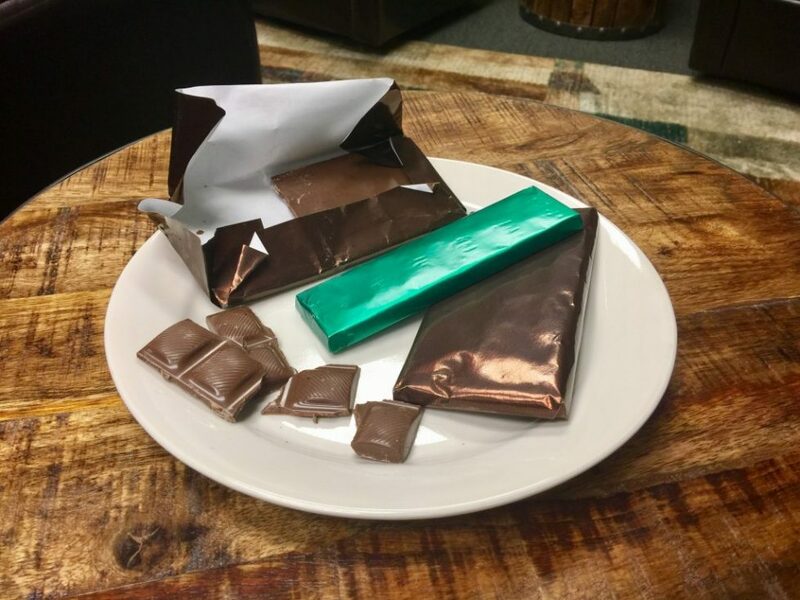 For this reason wax is a popular lamination choice for wrapping items with sharp edges, like chocolate bars, as it will more tightly hold to the rigid corners of the wrap. Additional benefits of wax-based adhesives include; creating a bond with better resistance to water, curing faster during the lamination process, and being more easily modified to meet FDA approval. One important drawback to note when using wax as your laminating agent is it can be susceptible to heat during product storage. The typical wax can have a softening temperature as low as 140°-180°F and can therefore potentially delaminate if stored long term in those conditions. One final, interesting, benefit of using wax as your laminating agent is the ease at which you can modify it. Unlike glue-based adhesives, different waxes (i.e. paraffin, microcrystalline, carnauba, ect.) can all be blended together without any advanced chemistry to burrow characterizes from one another. This means you can start with a paraffin wax (cost effective, better hardness) and blend it with a microcrystalline wax (higher adhesion) to easily create a custom wax that carries properties of each. Overall, both glue and wax adhesives serve as excellent laminating options when bonding foil to paper. When choosing which of the two for your structure you should take into account all factors including; bond strength required, dead fold characteristics, any required resistances, final storage conditions for your product and more. Still unsure about which lamination is right for you? Ask us! Our Engineering team is very knowledgeable on each method and always on hand to help answer any further questions you have.